Keys to selecting apple trees. – It is usually best to select a semi-dwarf or dwarf tree for espalier. 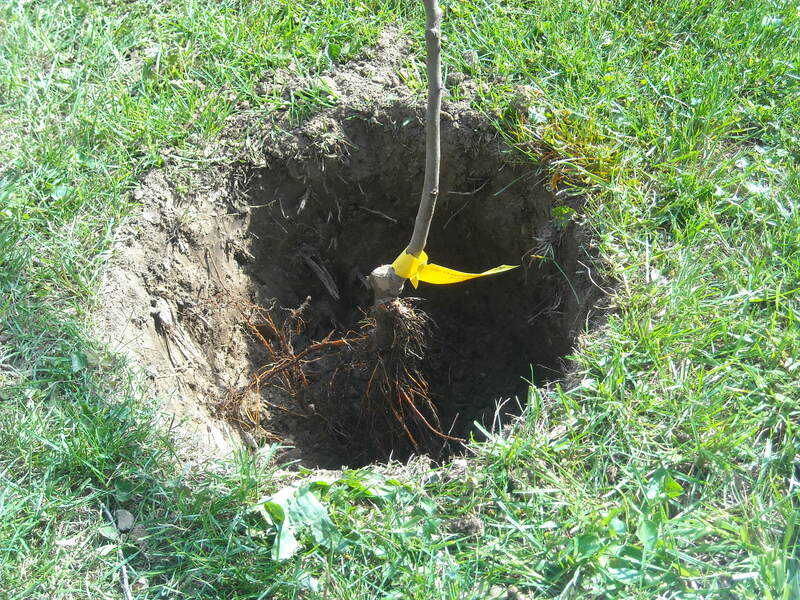 – Purchase dormant “bare root” trees. 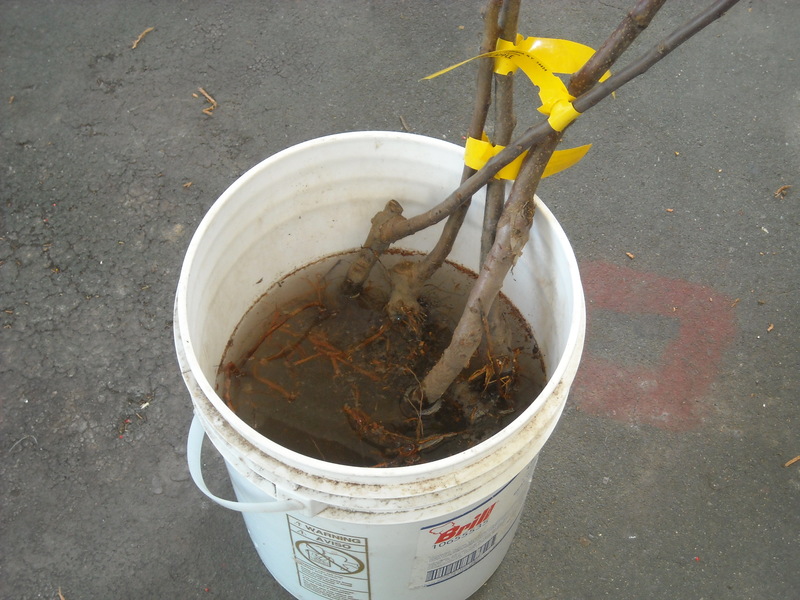 To prepare your trees for planting, soak the roots in a bucket of water for about 45 mins. before planting. As you can see in the image above, I was able to fit 4 trees in a 5 gallon bucket. While the roots are soaking, begin digging your planting holes. 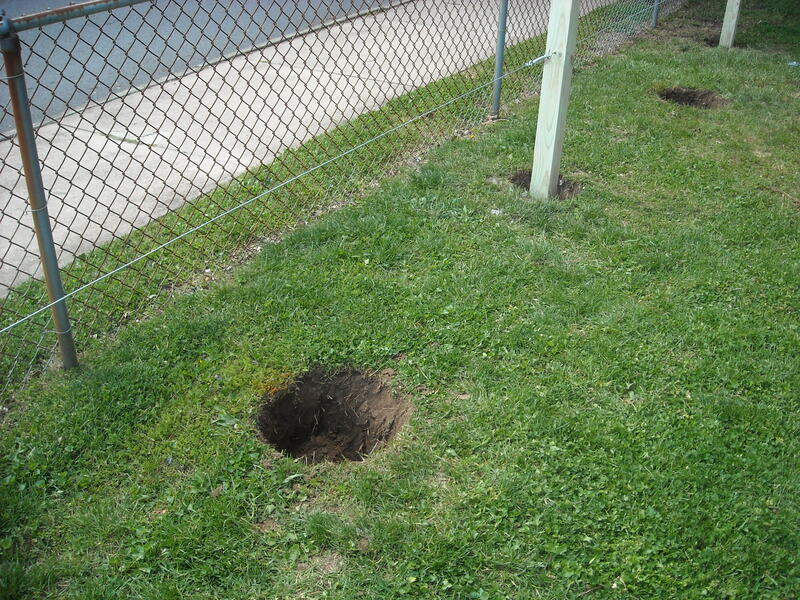 We dug our holes half way between our support posts. A general rule of thumb is to make your hole twice the size of the rootball, the entire rootball should fit nicely in the hole without twisting the roots around. With the hole completed, place a mound of dirt in the center of the hole for the rootball to rest on. Place the tree in the hole to check the fit. Make sure to spread the roots down over the center mound. 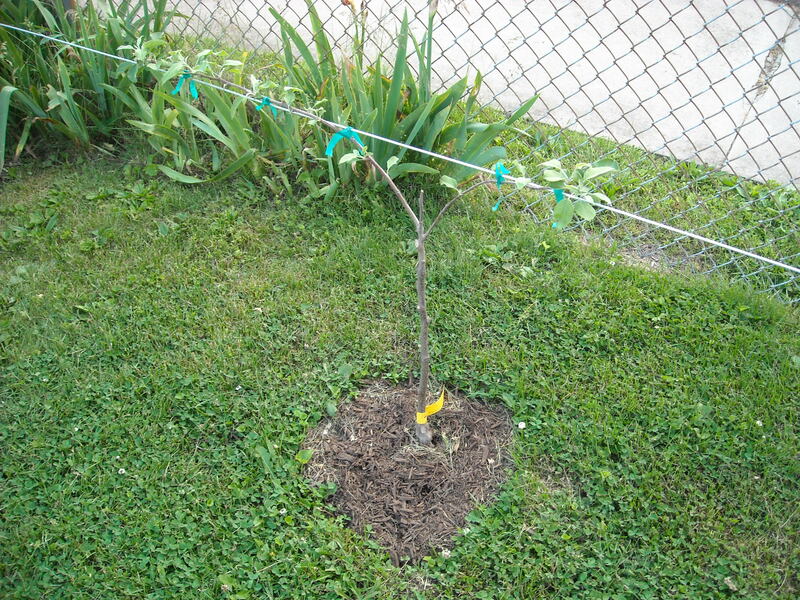 If you are planting a semi-drawf or dwarf tree make sure the graft union is about 3 inches above your final soil or mulch level. If the graft union ends up underground, the scion variety could root and you would lose the semi-drawf or dwarf rootstock characteristics. Note: I laid a piece of wood across the hole as a ground reference, to make sure that the graft union was above the soil line. You may have to adjust the depth of your hole. Once the hole size is correct you can place the tree in the hole and begin to fill the hole with the dirt you removed from the hole. I topped off our holes with a layer of good compost and then mulch. 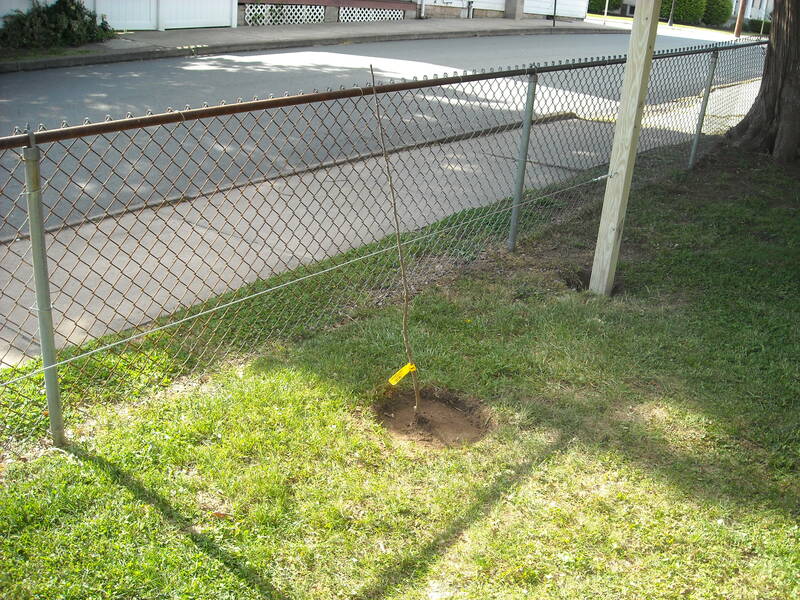 We tried to position our trees in the hole so that the tree is located a few inches in front of the support wire. 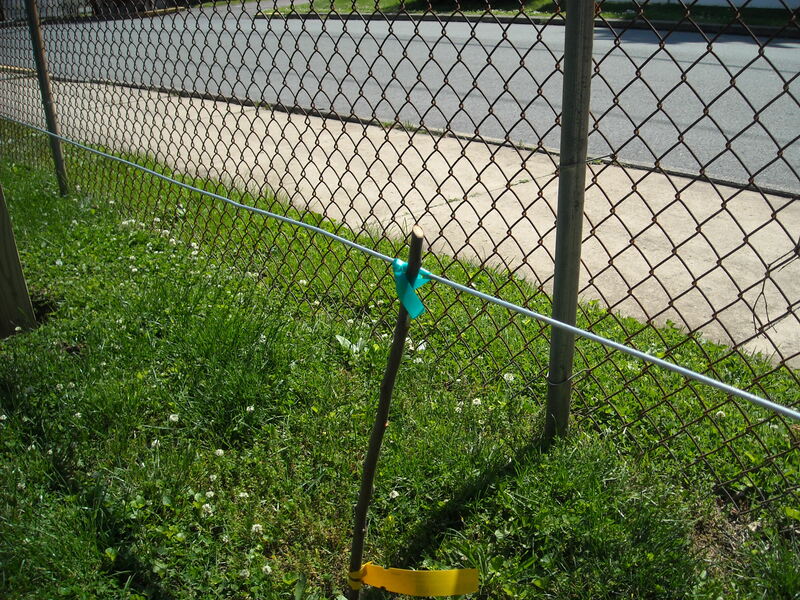 With the trees planted, I cut the trees back to about 2 or 3 inches above the wire. I also tied each tree off on the wire.